Well I got my bunks in for the trailer. Well half of them anyway. They shipped them as singles instead of pairs. So i got enough for one side. Easy fix I called them up and they are going to have them ship them out quick to me. While it could be a pain for someone who is missing stuff on an order I do know PS seems to take care of things quickly. I also know I could have done these myself pretty easy but I figure why not if PS is providing them. So I will be doing a write up on this hopefully this weekend. I want to drop the pontoon in my local lake. Tie it up and do the bunks and guides. So hopefully the weather permits me to do that. Once that is done I have the seats for the bow to play with. And a few other things I will be doing. and the bunks I got from them too, after unloading the boat from the trailer. So most plans get changed for me. I received the guide ons and the bunks. The other missing bunks came in today no problem. So I loaded up the stuff before I left work thinking I would mount the guide ons tonight and then be at the lake early. Fish a little. Then tie up and fix the bunks. So I go to our barn at the farm. Pull the boat out in the sinking sunlight. Get a camera turned on so I can try my hand at a how to. Only to realize the bottom of the deck would hit the top of the guide ons. Hmm so I think It is a combination of things. 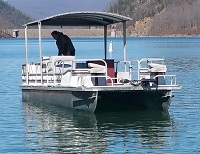 First 19 inch pontoons. I am sure the guide ons were designed for 25 and 25+ diameter logs. Plus if you look at the link above the bunks sit up from the cross member. Mine is basically a V shaped piece of metal that is bolted direct to the cross member. I know that may be hard to imagine. But it is dark out so I will take some pics tomorrow and post them. I emailed PS and I am sure I will hear from them. But it might not be until Monday. So I have been super busy at work. But I have managed a couple trips to the lake near my house. Unfortunatly there is a 10 HP limit. So it is trolling motor only there. So Anyway. I took my son out one evening and we found some shade and did a little cat fishing. Only caught one but had a good time. That trip started as a day to work on my rebuild. I was going to unload the boat and add the guides and bunks on. Unfortunatly I forgot a handsaw so I only got a set of guides on. So we ended up fishing into the dark. When I went to load all went ok until I went to pull out. Since my son is learning and he was being helped by a couple of guys that were just there fishing. We missed that I had placed my guides to far back. So as I pulled out my pontoon was sitting on top of one of the guides. It ended up breaking the guide and I had to lift the pontoon and remove the guide from under the log. .... Not how I expected things to work. It was my fault. But I fortunately didn't tear a hole in the log ... just a small dent. It honestly looked worse when I took the pics. I'll post those pics soon. So it is always an adventure it seems. I did try out my front deck seats. And while my deck is soft there I really do like them up there. I almost think they may be a bit heavy but I like them. I need to figure out how to mount my 10 hp tiller steer on there so I can use it at that lake. Going to start the tear down soon I hope. Work is kind of busy though. But seems to be settling down. I do have to go out of town at the end of the month though... Headed to Houston for a training thing. Hi guys. Been a long time... Been so busy I haven't done anything to the boat...plus it has been cold. So anyway I just got back from looking at another pontoon. Newer boat in worse condition. It is a 1996 Mid American Fun Island. 24 foot. It doesn't have a trailer. But two motors. Neither running. All the railing. It has some things mine doesn't. Also the Mid American has a couple motors that I will get rid of. My thought is since I am rebuilding. I might as well be getting all the deck and to do that on my boat is going to be expensive. If I get this one tear it down and rebuild it. Move my motor over from my boat. Then once it is done sell my boat. between that and the motors I believe I can more than pay for the other boat. Anyone see anything wrong with that thinking? The biggest problem now is no trailer. Moving it will be a little tricky. Anyone near Cincinnati want to loan/rent me a scissor trailer or help me move this boat.